A few of you have asked about the tools I use to develop e-Learning training sessions, , , so thought I would give you an “inside look” at my home office “studio” and a brief description of the equipment and software I use. 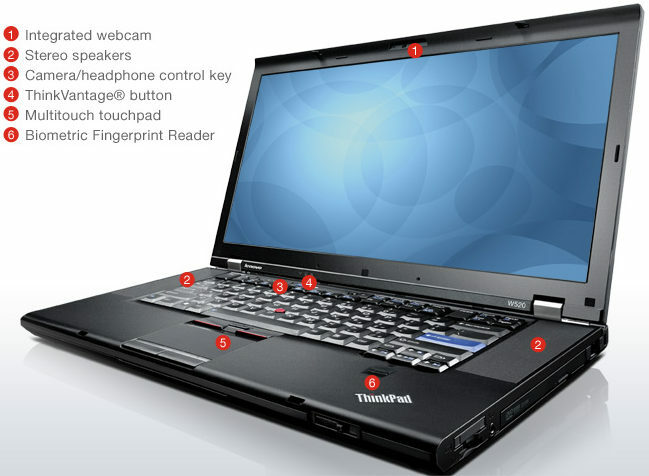 – My desktop is actually a laptop, a Lenovo W520 ThinkPad. This may be the best thing I’ve done in years, , , awesome. It sits on a Lenovo Mini Dock Plus Series 3 docking station for a power source and extra connectivity ports. Nice to be able to start-up in just a few seconds each day. – HP Photosmart C7280 All-in-One printer has been with me for a couple of years, , , works great in wireless mode. Prints excellent color front and back, faxes, copies, and scans plus it uses easy loading ink cartridges. Great 4×6″ photo prints plus it reads virtually every camera card made. 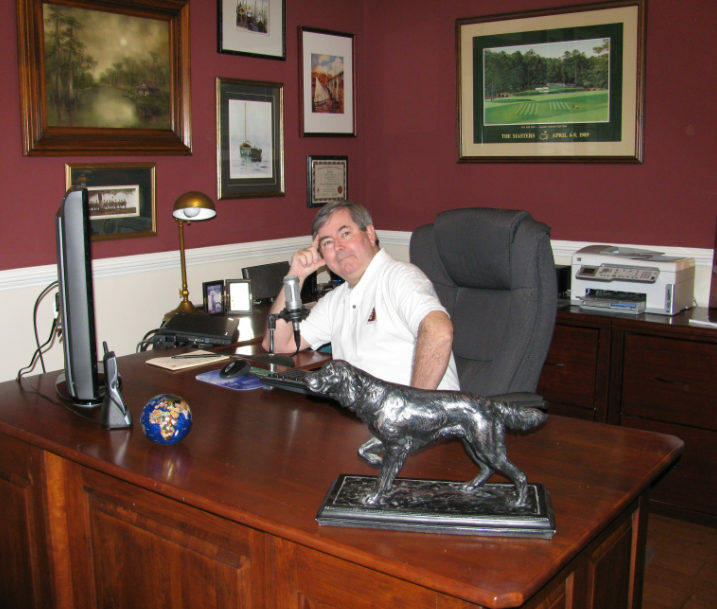 – My display was a surprise Christmas gift, , , a Samsung 36-inch HD TV/Monitor. I only use it for a display monitor. What’s great about it is being able to throw several windows up on it at the same time to work with. While developing 20MITM e-learning sessions this weekend I saw a nice boost to my productivity plus it is so much easier than going back and forth to different windows on a smaller display. I tried using multiple monitors and although this works fine I didn’t like the desk space required and having to move the cursor across screens, , , just not as easy as having it all on one big screen. Thank you very much Dorine and Eddie, , , I will enjoy this XMAS gift for years to come. How do you like the shirt I purchased in Dar es Salaam? – Canon LiDe 210 Scanner – Even though the HP All-in-One printer scans, I like this scanner and it only cost me $99.00, , , small footprint, very quiet, extremely easy to operate, and excellent quality scans. – My audio equipment is professional grade. 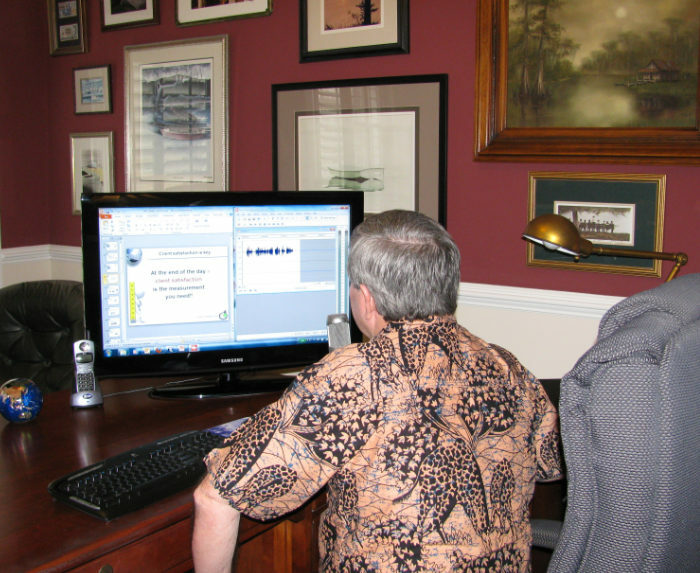 When Tom Mochal and I decided to develop the 20 Minute IT Manager e-Learning training in 2006, we knew we needed high quality audio equipment so we both invested in the same setup and it has worked extremely well for us. Each of us has an Edirol UA-25 USB Audio Interface System with an Audio Technica AT2020 Studio Microphone. Sound quality of your work is good as it gets with this equipment. I use a lot of software as we all do, but let’s stay with what we use to produce e-Learning sessions. PowerPoint 2010 – Best version yet although I’m still trying to get familiar with the new interface. Hard to beat PowerPoint and the use of PNG images to make your presentations “pop”. Love PowerPoint!! Articulate Presenter ’09 – Installs as a PowerPoint plug-in and creates the presentations we end up with. This is a great tool we have used a great deal. It is very versatile and creates a nice user interface. 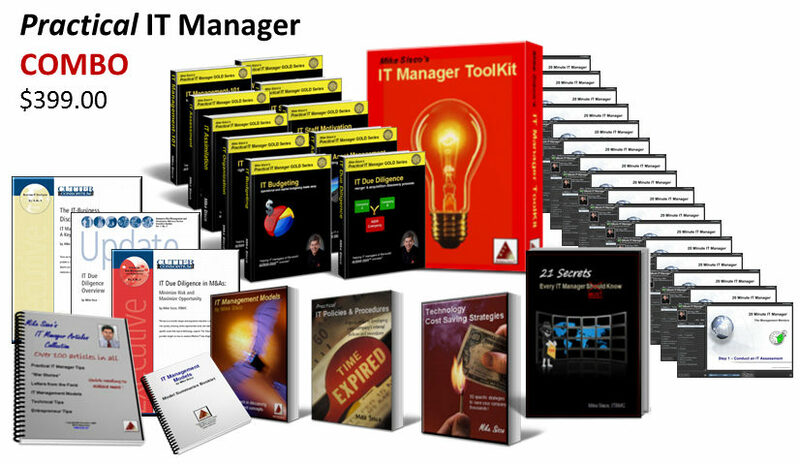 I liked it so much I built my IT Manager Institute Self Study using these tools. 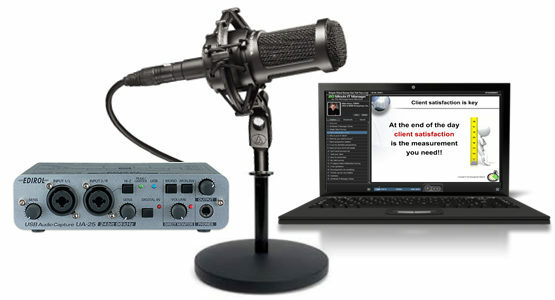 Sound Forge Audio Studio – This is what we record our PowerPoint slide “voice over” with. Has great editing capability, , , much better than the earlier versions of what was included in PowerPoint. Haven’t tried the audio recording features of PowerPoint 2010 yet and know it’s got to be better, , , a project for another time. That’s it, , , production is simple and straightforward. Just develop your PowerPoint presentation, record the voice-over for the slides, and publish the content using Articulate Presenter. 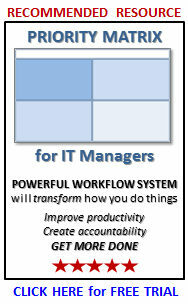 Take a look at a 20 Minute IT Manager session titled, IT Initiatives Portfolio. 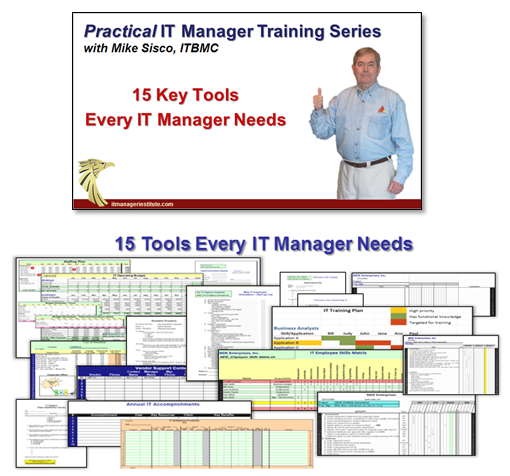 This entry was posted in IT Manager Tips and tagged articulate, audio equipment, e-learning tools, mike sisco. Bookmark the permalink.